Home/Sikh News/Badal said that the state government was making efforts for release of Sikh political prisoners with every possible way as per law. 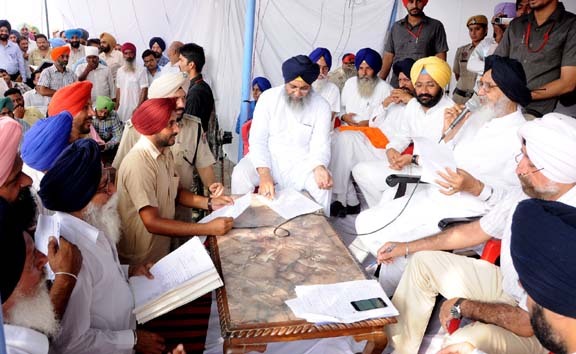 During the Sangat Darshan Programme held in Dhuri segment, Punjab Chief Minister Parkash Badal said that the state government was making efforts for release of Sikh political prisoners with every possible way as per law. Talking to media persons, the issue of Sikh prisoners is very sensitive one and the state government is overseeing the situation very closely. He appealed people to understand the matter before taking the next step. He said that law and order would be maintained in every condition and no one would be allowed to disturb the peaceful environment of the state. Condemning the demonstration against Akali minister Tota Singh, he said that such incidents affect the interests of the state negatively. “Such people (agitators) do not know the ground realities. Only these people play such kind of tricks which is not fair. Supporters of these incidents want to bring black days back”, he added.